Powers/Abilities: Satana's demon heritage grants her a degree of superhuman strength (Class 10), durability, and other physical abilities. She likely possesses immunity or some degree of resistance to aging and conventional disease. The full range of Satana's superhuman powers remains unknown. She is capable of casting magical spells, but her limits in this area are uncertain. She can levitate herself off the ground, though she apparently cannot fly. She is able to strip away false images of others, laying bare their souls and forcing them to see themselves as they truly are. Satana can also perform solo teleports, but usually uses ancient burial grounds to act as portals. Satana requires the draining of souls to survive and she can only drain the souls from men, not women. It is not known how many days she can go without taking a soul. To do so, she usually kisses her victim as she draws forth his soul, causing his body to shrivel. The soul would then take the form (visible at least to Satana) of a butterfly-like being, which she would grasp with her fingers. She would then crush the butterfly form, seemingly causing it to disintegrate, but actually absorbing psionic energy from the soul. After she feeds on the power in a soul, the spirit is cast down into her father's realm of Hell. After spending time in Hell after her death, Satana learned that by consuming more souls than she needed, she could increase her own power. She also learned that by impregnating weapons with her body fluids, she could gain the soul power of victims slain with those weapons. Further, by marking a man as her servant, she could also gain the power from souls slain by that man, using the above weapons. Satana has extensive knowledge of black magical lore, which war further strengthened by her time spent in Hell following her death. She can project bolts of soulfire, similar to that used by Hellstorm or the Ghost Rider (Blaze/Zarathos), which causes intense psychic or spiritual pain, but can also be perceived by its target as heat or physical force if its wielder so wills it. She has added magic to technological devices, for instance utilizing a tracker of electromagnetic energy to locate a specific soul in Hell. Satana was formerly bonded too an immensely powerful demon known as the Basilisk, which she could release to slaughter her foes and then return it to herself. However, each time she released the Basilisk, her control of it lessened. Other distinguishing features: Satana has had in the past incredibly long eyebrows, which extend above her head in the semblance of a devil's horns. (Marvel Spotlight#13(fb)/Hellstorm#2(fb)) - Satana is the second daughter of the arch demon Marduk Kurios (who more commonly referred to himself as Satan), and Victoria Wingate. Her father had taken the human form of a Mr. Hellstrom to sire children on Earth. Satana was born three years after her older brother, Daimon, but while Daimon was also closer to his human mother, Satana was definitely always daddy's little girl. For the first six years of her life she lived in their mansion on Fire Lake. Even as a toddler, Satana earned her father's affection by killing birds or other such behavior. Both Satana and Daimon were home schooled, as their father did not want them to be defiled by the townfolk. When Satana was six, her mother walked in on a ritual slaughter of a cat Satana was performing for her father. Her mother was overcome by the horror of what was going on, and when her husband revealed his true nature to her, she was driven utterly insane. Their mother was taken to a mental institution, while the children were split up to be placed in homes. (Marvel Preview#7/2 (fb) - BTS) - The car carrying Satana disappeared en route. It was never found, nor were the driver, the young nurse who was escorting her, nor Satana herself. (Haunt of Horror#5 (fb) - BTS) - Satan presented Satana with her feline demonic familiar, Exiter. (Haunt of Horror#2/8 (fb) - BTS) - Satana and Zannarth were banished from their Hellish realm, apparently by the Four. Zannarth was sent to a Netherworld and Satana was sent to Earth. (Vampire Tales#2/7) - In Manhattan, Satana wandered the streets, where she attracted the attention of a would-be predator. The man followed her in the alley where he intended to have his way with her. As soon as they touched lips, Satana drained his life and left his desiccated corpse in the alley. (Haunt of Horror#4 (fb)) - Satana felt something drawing her to the West Coast, possibly the powers of the Four, whom she believed to be responsible for her banishment. (Vampire Tales#3) - Now in Los Angeles, Satana prevented a mob, whipped into a frenzy by a tirade from politician Harry Gotham, from attacking a small group of the Church of the Dark Father. At her word, the mob dispersed. Later, after feeding on another man in an alley, she joined one of the cultists, Ruth Cummins, at her apartment. Satana was surprised to learn that Ruth had the mark of Satan on her shoulder, but when she attempted to contact her father she found her summons blocked by a spell of the Four. Soon after, Darkos Edge and another assassin, sent by Gotham, broke into Ruth's apartment and attempted to kill her, but ended up killing Ruth instead. Satana killed the unnamed assassin, stole the soul from Edge, and then found Gotham and took his soul as well. (Haunt of Horror#2/6 (fb) - BTS) - Satana moved in with another member of the Church of the Dark Father, Gloria Hefford. Not long after she was joined by Exiter. (Haunt of Horror#2/6) - Satana targeted, seduced, and feasted on the soul of Henry "Hank" Johnson, who was not having any luck at a single's bar. She then identified Rich Corbett as a suitable pawn to use against the Four. Seducing Corbett, she convinced him to assassinate Miles Gorney, who was apparently the leader of the human representatives of the Four. After she had sent Corbett off, however, she managed to cast a spell to observe the actions of these four, and learned that they needed a human sacrifice to complete their own spell. Too late she rushed to stop Corbett, and when he killed Gorney, the Four's spell was sealed, closing off the portal to Hell so that Satana could not return. Furious at her own stupidity, Satana drained the soul of Corbett, killing him. (Haunt of Horror#2/8) - Satana journeyed to the Cave of the Seven Winds, from which she traveled to the Netherworld where she hoped to be able to access her father's Hell. En route, she encountered Zannarth, whom she coerced into assisting her in her efforts. The Four sent a Nightbeast against them, but Satana mesmerized it and enlisted it to her own service. They were ambushed by another team of demons, whom they overpowered before continuing their journey. The Nightbeast was apparently destroyed in this second assault. As they continued they found the corpse of Trachos, the former leader of the Four, killed by them for his failures. (Haunt of Horror#4) - Within the Netherworld, Satana and Zannarth were confronted by the remaining members of the Four. Zannarth was slain by Ellin, and Satana attempted to gain a brief respite by forcing the Four to see themselves as they truly were. However, rather than a momentary distraction, this caused the Four great agony, and they reverted to their human forms. Taking advantage of their weakness and surprise, Satana rapidly moved from one to another, kissing the three men and draining their souls. However, she was then confronted by the still living Trachos, who revealed himself to be none other than Miles Gorney. Laughing as he vanished, Gorney refused to answer any of Satana's questions. Nonetheless, she felt the barrier to Hell fade away. However, sensing that she would gain answers, and perhaps vengeance, on Earth, she headed back there. (Haunt of Horror#4/3 (fb) - BTS) - A group of former soldiers, under the direction of Monsignor Jimmy Cruz, ambushed Satana, beating her brutally and leaving her for dead. (Haunt of Horror#4/3) - As Satana lay dying, she tried to contact her father, but found the portal to his realm once again closed. 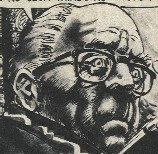 Exiter directed surgeon and former priest Michael Heron into the alley to help Satana. When one of the men, Arni Holder, a former Green Beret, came back to make sure Satana was dead, Exiter slaughtered and consumed him. Heron brought Satana back to his room, and Exiter brought her night porter, on whom Satana fed to regain her strength and heal her wounds. Upon awakening, Satana attempted to feed on Heron as well, but found him able to resist her call--the first ever to do so. Cruz himself led a squad to kill Satana, but they ended up having to settle for kidnapping Heron when Satana escaped them and the police began to approach. Satana tracked one of Cruz's men and forced him to tell him Cruz's location before she consumed his soul. Exiter went on ahead, but was slaughtered by the N'Garai, summoned by Cruz. Satana approached Cruz silently, so that he had not time to summon demons, but rather used his gun against her. She dodged Cruz's bullets then slew him and ate his foul soul. (Haunt of Horror#5/4 (fb)) - Satana parted ways with Heron, but gave him the Azshiran, a ring that could protect him from any demon born of Satan. (Haunt of Horror#5/4) - Continuing her search for Gorney, Satana slew Walter Dean, a Hollywood producer/director who had aspired to membership in the Camarilla of the N'Garai. She was then confronted by the demon Agathon, who showed her that Gorney had captured Heron and cut off his hand. Agathon blasted Satana unconscious and then brought her before Gorney. Awakening, Satana impaled Agathon on one of Gorney's structures and then took out Gorney's servants with the aid of Heron, who was mortally wounded in the process. Satana recognized Gorney as her father, Satan, as no one else could have injured a man wearing the Azshiran. Satan revealed that it was all just a test to prove Satana's power and loyalty, but she turned her back on him by allowing Heron to die without her consuming his soul. Furious, Satan banished her to Earth until the time of her death. (Marvel Spotlight I#24) - Gloria Hefford unwittingly summoned and was possessed by the demon-mother Kthara, which attracted the attention of both Satana and Daimon Hellstrom. As Gloria, Kthara duped Daimon into believing that Satana was the threat, and when he confronted Satana, Kthara used her spells to goad him into combat and to enhance his power. Satana was consumed in Daimon's hellfire, but she was protected and restored by the Basilisk. She arrived in time to find Kthara about to slay Daimon in a ritual sacrifice that would allow all of her ravagers to be free to claim the Earth. Satana freed Daimon and the two struggled against Kthara and her demon-hordes, but even they had not the power to stop her. Finally, Satana summoned the Basilisk, which slaughtered Kthara and left Satana drained. Daimon attempted to apologize, but Satana instead cursed him and told him that should their paths cross again she would take his soul and laugh at the taking of it. (Marvel Premiere#27) - Satana detected magical energies which drew her north to the town of Chandler, California, where she observed a group of men trying to burn the witch Deborah Hirsch. However, Deborah turned out to be possessed by Dansker, and the attacks upon her merely allowed Dansker to take control. Dansker blasted the crowd, killing the people and stunning Satana, and then prepared to perform a spell which would allow him to travel to Earth physically. Satana overpowered Dansker's limited form and summoned the Basilisk to slay him. (Marvel Preview#7 (fb) - BTS) - Realizing that slaying Satana outright would release the Basilisk from within her, which might destroy the entire world, the Camarilla of the N'Garai conceived of another plan. They cast a powerful spell which transformed Satana into a mortal woman, Judith Camber, instilling her with false memories of her past life with her family. However, within an hour of the transformation, the Basilisk rebelled against these constraints and slew Judith's family. (Marvel Preview#7) - "Judith" returned home to find her family dead. While she was crushed by this trauma, it allowed Satana's personality and form to become dominant for brief periods. 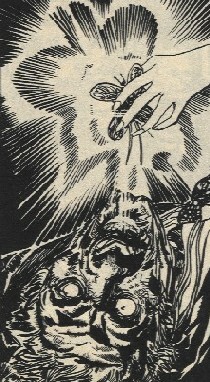 While Camber was confused by her dual memories and personalities, the Camarilla succeeded in extracting the spirit of Satana from Camber, and planned to sacrifice it to the N'Garai. However, Camber, realizing that doing so would end her own false existence, tracked the Camarilla to the Church of Dis, and unleashed the Basilisk. The arch-demon destroyed the entire church and slew the Camarilla. Satana regained her true form and memory, and destroyed the soul of Abelard before it could pass on to any final resting place. (Marvel Team-Up I#80, 81) - Dr. Strange was possessed by a wolf demon as a result of a curse of the Basilisk. Satana traveled to Strange's mansion and offered her assistance. Spider-Man brought the possessed Strange back to the sanctum, where Satana cast a spell that transported the trio to an astral plane, where they fought a legion of the Basilisk's demons as they edged towards Strange's soul. Satana summoned every erg of her power to destroy the demons and shatter the casing containing Strange's soul. However, the effort left her spent and the Basilisk broke free from her and struck her down from behind with its sword. However, as Satana died, so, too, did the Basilisk, which had become intrinsically attached to her soul. BTS - In death, Satana returned to her father's realm of Hell. (Hellstorm# 8(fb) - BTS) - Reverend Joshua Crow began having dreams in which the lord spoke to him. He had visions of innocent souls trapped in Hell. The voice said that the power to release them was in Crow's hands--and the voice charged him with the task of rescuing them from the eternal fires, and giving them a second chance. Crow followed the instructions of voice and went to New York. From there he began to use his power to summon these souls from Hell and placed them in the bodies of people in a seemingly hopeless comatose state. Although he hinted as if he were resurrecting the souls of the comatose victims, he knew he was bringing souls from Hell. However, he believed he was harrowing Hell, just as Christ had done, bringing God's mercy to the Damned. Crow performed six such "resurrections" over the following three weeks. However, it was actually the Devil who had spoken to Crow, and the souls he had reincarnated were "lightning rods for evil"--focal points which Hell would use as anchors to their reality as it tried to take them back. Through them, it would be able to manifest itself, in small ways at first, escalating as it gained strength. One of theose resurrected was Satana, who took the form of a woman named Julia. (Hellstorm#12) - Satana set herself up inside the Body Orchard, a deconsecrated church in which she kept a large number of her victims. She kept them chained to the walls and ceiling, and wrapped them in a spell which continually regenerated their lives--life that Satana constantly gnawed at. In Times Square, Satana posed as a streetwalker, consuming the soul of a man who thought he was going to get some lovin'. (Hellstorm#20) - In the Body Orchard, Satana contemplated her latest plot. By eating more souls than she needed she had begun to amass large amounts of power; power which she might use to take over Hell. She was confronted by Detective Gunyon, a man who had lost his job (and much of his mind) after having Hellstorm forcibly rip information from his mind. Gunyon sought to kill her to punish Hellstorm, but Satana instead took control of him. She branded him with a magic symbol, such that every act he committed would be attributable to her. She also gave him a box of bullets, each impregnated with certain of her body fluids and inscribed with her mark. Her instruction was for him to use them to commit mass murder. (Hellstorm#21 - BTS) - Stephen Loss whipped himself with barbed wire for his dark dreams about Satana. (Hellstorm#21) - Satana and Gunyon became lovers. Well, that's not quite accurate. He loved her. She was just tonguing out his soul a sliver at a time. Meanwhile, she contemplated her plan. Those shot by Gunyon with the bullets she had given him would have their souls consigned to Satana, and she would eventually grow powerful enough to challenge the supernatural supremacy of Heaven and Hell. (Witches#1 (fb) - BTS) - Satana apparently perished again under unknown circumstances. (Witches#1) - Satana was returned to Earth by Dr. Strange to serve as the representative from the underworld to assist Jennifer Kale and Topaz against the Hellphyr. (Witches#2) - Learning the reason for her return, Satana mocked Strange and her would-be allies. Later, while participating in a training exercise under Wong, she accidentally struck down Jennifer Kale, leading to a near confrontation between the two. All three remained unaware as Lilith sent a newborn Lilin to assault them. (Witches#3) - Satana unwittingly leapt into the path of one of Jennifer Kale's magical bolts in mid-battle with the Lilin and was knocked out. After Kale destroyed the Lilin, Satana attacked Kale, and then taunted her until she fled, refusing to work alongside her anymore. (Witches#4) - Satana and Topaz joined Kale against the Hellphyr, and she was confronted by her father, who revealed he had orchestrated the whole thing. Satan offered her a chance to rule alongside him if she allowed the Hellphyr to destroy all magic-users on Earth, but she turned her back on him and helped destroy the Hellphyr. Afterwards, she joined with Kale and Topaz in refusing to surrender the Tome of Zhered-Na to Dr. Strange, instead leaving with the pair. (Nick Fury's Howling Commandos#1 (Director's Cut)) - Satana was revealed to have been recruited into S.H.I.E.L.D. 's Howling Commandos unit. (Nick Fury's Howling Commandos#6) - Satana was among the Commandos who launched an assault on the forces of Merlin. (Marvel Tarot#1 - BTS) - The First Tarot showed Ian McNee there were two Devil cards, one of them was Satana, the other Daimon. McNee noted Satana tried out personalties like some women try on shoes. He continued that his spies in the splinter realms had revealed trouble was brewing in the lake of fire, chances are Satana and Daimon were involved. (Legion of Monsters: Satana#1) - Satana cast the soul of Jason Silence down to Hell as her monthly tithe to her father. (Legion of Monsters: Satana#1) - The next month, after consuming the soul of a man on the streets, Satana, back in her classic costume, returned to the Body Orchard where she was trapped within the Electric Pentagram by Jennifer Silence, Jason's twin sister. Using rituals learned from the Fur Journal, Jennifer had Satana write a contract in blood to bring Jason back to Earth alive and unharmed, and not to harm any of the Silences or their friends, family, business relations, etc. Upon completion of the contract, Satana was released from the Electric Pentagram, after which she slapped down Jennifer and forced her to reveal where she had learned how to capture her. Examining the Fur Journal, Satana observed the diagrams of her written by Stephen Loss (though she knew not who had written them) and then she returned the Electric Pentagram to the Fur Journal. Binding Jennifer to a man near-death in her Body Orchard, Satana magically enhanced an electromagnetic sensing device to allow her to track Jason Silence's soul, then traveled to Hell to recover Jason. In the process she was attacked by the Scorpion Queen, who had possibly taken Jason's soul for herself, and slew the Scorpion Queen and her offspring. Satana then returned Jason to Earth, fulfilling the contract, but then killed him again and added Jennifer Silence to her Body Orchard. (Ghost Rider VI#33 - BTS) - Deacon and Blackout considered her as a possible agent in their fight against Ghost Rider (Blaze). (New Avengers I#53) - The Eye of Agamotto appeared to Satana as it considered her a possible replacement for Doctor Strange as Sorcerer Supreme. (Dark Reign: The Hood#3) - The Hood (Parker Robbins) met with Satana to discuss controlling the demonic power he associated with the cloak. Satana advised that the Hood no longer wear the red cloak anymore. She desired the mystical cloak for herself, but the Hood would not let her have it. (Dark Reign: The Hood#4) - The Hood had Satana set up a workshop in one of his safehouses, Satana mystically controlling several of the Hood's villain army to help move stuff in. The Hood spoke more with Satana regarding Dormammu, but only after she instigated a protective spell that prevented anyone else knowing what they said. (Dark Reign: The Hood#5) - After witnessing the Hood manifest a flaming cloak about him, Satana informed the Hood that he had already bonded with Dormammu and that the cloak was now only a token. (Deadpool Team-Up#892 (fb)) - After dispatching a minor demon, Satana was swindled out of her soul at a nearby casino by five geeky guys (actually the demons Asmodeus, Belasco, Dormammu, Lucifer, and Mephisto) who sought to marry her. (Deadpool Team-Up#892) - Satana sought the aid of Deadpool, who went to kill the five would-be nerds only to have them reveal their true selves. Later, Deadpool and Satana married to break the original contract where Satana took part of the merc's soul to seal the bond. She suffused Deadpool's sword blades with hellfire and he was able to apparently kill Asmodeus, thereby restoring Satana's soul to her. She later left Deadpool without consumating the marriage. (Girl Comics#3/5) - Satana took the soul of another man. Satana took the soul of a teenaged boy, who wanted to lose his virginity. (Chaos War: Chaos King#1) - Satana was amongst those who fell in the onslaught of the Chaos King's attack on Hell. (Heroes for Hire III#2) - Investigating an influx of powerful handguns that could penetrate armor, Paladin called in Satana to the City Morgue, where she revealed the true nature of the weapon as a demonica fused to the dead man. She identified it as a Soulcutter that harvested souls to the point that it could animate the owner's corpse. Satana disintegrated the body before the gun could fire at Paladin. (Heroes for Hire III#8) - Paladin again called in Satana and she performed a naked spell of redaction that made the rest of the demonica inert, but needed Paladin to protect her while casting the spell. She then teleported away. (Thunderbolts II#155) - Lack of magical defense was found to be a weakness with Luke Cage's new Thunderbolts. Dr. Strange helped Cage take Satana on board as a occult specialist. Dr. Strange gave Cage a mystical talisman should Satana slip into her demonic mode. (Thunderbolts II#156) - Luke Cage introduced Satana to fellow (incredulous) Thunderbolts, Ghost, Juggernaut, Moonstone. She had already inscribed the Worldsong markings into Man-Thing. She began to seduce the other three Thunderbolts until Cage triggered the talisman to rein her in. All six then teleported to time-traveling but haunted Gothenvald Castle, Germany, where they faced a mystical attack of Dirae, zombies and poltergeists. (Thunderbolts II#157) - Satana spewed the Flame of Animus Infernus to eliminate the supernatural assault and identified where Baron Gothenvald was steering the attack, stating that he had to be separated from the castle to stop further attacks. 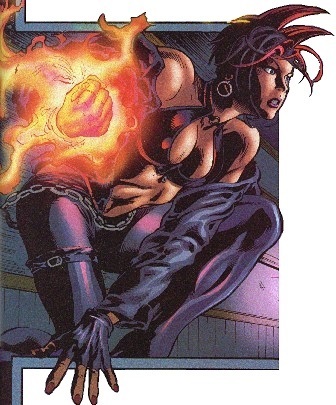 The Thunderbolts stormed the castle, but Satana stayed behind, her energies depleted. Gothenvald set loose the Incarsicus, which shrouded the Thunderbolts in personal nightmares, but Satana's timely intervention saved them. Gothenvald escaped. The group (without Cage and Juggernaut) then joined Songbird, Mach V and Fixer with the Thunderbolts' B-team ("Underbolts" - Boomerang, Centurious, Mr. Hyde, Shocker, Troll) in Najaf, Iraq, to stop a zombie-led riot. (Thunderbolts II#158) - Satana used the mystical energies from the mass graveyard to construct a magical barrier to stop the reanimation of the dead, but the attack was not mystical in nature. Centurious and Hyde stopped the transmission. The Serpent-possessed Juggernaut breakout from the Raft forced the Thunderbolts to return to base. Satana used a catatonia spell to subdue the prisoners still left on the island. (Thunderbolts II#160) - In the wake of the Raft breakout, Satana meditated and later helped calm Man-Thing while the world was in the grip of fear by the Asgardian Serpent. Satana, Moonstone, Mach V, Ghost, Songbird, and Man-Thing transported to Chicago to stop the Juggernaut, but Swamp-Thing transported away, ascending to the next level of existence initiated by the Worldsong inscription. Satana recognized his potential as more than just a transporter and easily countered Moonstone's aggression. Satana scribed protective runes on the Ghost so that he could phase in and identify what was possessing Juggernaut, but was expelled, despite Satana's guidance. (Thunderbolts II#161) - Able only to transport herself, Satana returned to the Raft to tell Warden Walker what had happened. Satana began tapping darker magic like that encountered with Baron Gothenvald to develop new a teleportation transport that also combined technology. Thunderbolts Tower then vanished including Satana, the Fixer, and the Thunderbolts B-Squad. (Thunderbolts II#162) - Thunderbolts Tower reappeared at Lake Michigan to help the other Thunderbolts stop an invasion of mutated water creatures. Satana unleashed fire from her mouth to consume the creatures. Satana then aided Moonstone to have Man-Thing absorb all the creatures, becoming a giant Man-Thing in the process, much to Satana's excitement, and helped Man-Thing spawn a consciousness bulb from his fiery remains. Satana joined the the B-Squad (Mr. Hyde, Boomerang, Centurius, Troll), Fixer and Moonstone as they escaped dimensionally in Thunderbolts Tower. (Thunderbolts II#163) - Man-Thing's new unpredictable nature threw them back in time; now in the WWII era (1943) in the German alps, Satana helped quell Mr. Hyde's rage with food and pleasuring succubus spell, and also reveled in the Man-Thing's growing new form. When Nazi ground forces attacked, Satana released Hyde upon them, summoning demonic forces to bring those the German soldiers had killed to fiery life. Then the Invaders (Captain America, Namor the Sub-Mariner) arrived. (Thunderbolts II#163.1) - Meanwhile, Ghost, Cage and Mockingbird checked ancient burial grounds that Satana used for portals, charging ancient spirits to protect her hideaways. (Thunderbolts II#164) - The Nazis defeated, Moonstone suggested that they blend in and take on contemporary disguises, Satana doing so for herself and Boomerang. Calling themselves the American Thunderbolts, they agreed to help rescue the Human Torch from Baron Heinrich Zemo's base nearby. Flirting with Namor, she was unconcerned about starting a new timeline as Man-Thing could cross dimensions. The Thunderbolts then checked on the swamp-walker and Satana watched on as Mr. Hyde threw the growing creature corpses. (Thunderbolts II#165) - Attacking the Nazi base, Satana tended to the dehydrated Namor, taking him into Thunderbolts Tower. She called on ancient Atlantean magic, the spell requiring intimate physical contact to be fully effective. Namor complied. The two returned just as the American Thunderbolts and Captain America destroyed the base. Satana and the others rushed back to Thunderbolts Tower and it disappeared again. (Thunderbolts II#167 (fb)) - Arriving in 1888 in London, Mr. Hyde and Satana separated from the main group. Satana was captured by ancient spirits called Iceni that sought out warrior women for their war. Satana refused and was help captive, but their bloody trail paralleled that of the Jack the Ripper murders. (Thunderbolts II#166) - The other Thunderbolts, again disguised, helped the local police with the murder investigations, thinking Satana may be involved. Mr. Hyde hunted down the Curse-Keeper that kept Satana bound. Finally the other Thunderbolts arrived. (Thunderbolts II#167) - Overcoming the initial misunderstanding, Satana was freed and relished consuming the remaining Iceni souls. Soon after and aboard Thunderbolts Tower, they traveled back in time again, this time to the age of Camelot. Comments: Created by Roy Thomas and John Romita. Satana made her debut in October, 1973, so this profile (completed in October 2003) celebrates her 30 year anniversary! Time for that Warren Ellis Satana series we were promised a decade ago! I would love to see him write a multiple issue war between Satana and Hellstorm for the rule of Hell, culminating with the return of their father, Marduk Kurios, reborn through Lavoisin, and attempting to take back his domain. I'd be happy with Warren Ellis, Garth Ennis, Alan Moore, Steve Gerber, or other such demented geniuses. The recent story by Robin Furth was a welcome return to the Satana we know and love. 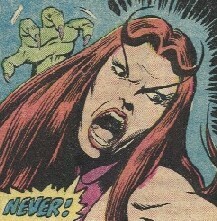 The dates are topical, but Marvel Team-Up I#81 list birth and death years of Satana, indicating that she was 24 at that time, meaning that Daimon was 27 then. How much "Marvel Time" has passed since then is difficult to say. Satana also appears in Marvel Spotlight I#22, but it appears to just be a form adopted or conjured by Madame Swabada, rather than Satana herself. Most of Satana's really good pictures are from the black and white titles. The exact chronology of Satana's magazine and regular comic appearances is uncertain. Marvel Preview#7 details some of the delays and other problems with publication that hindered Satana's success. Haunt of Horror was cancelled with issue #5. Number eight was to introduce Satana to a significant male, and Claremont had already written the next two issues. Not quite sure why Dormammu and Satana didn't mention anything in Deadpool Team-Up after their dealing with the Hood. That said, her hairstyle in Deadpool Team-Up matches that of the Witches series, so perhaps DTU comes before the Hood saga. Sledge Hammer #1 featured a tv horror host Satana (ala Elvira), but as a tie-in to a non-Marvel tv show it's almost certainly not continuity, and even if it somehow was, it was only an impersonator and not Satana herself. 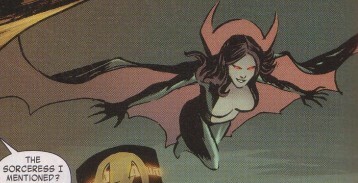 Satana was revealed as one of the mystics seen in the Eye of Agamotto's vision in New Avengers I#53 in Avengers, Thor & Captain America: Official Index to the Marvel Universe#15 (2011). Profile by Snood (and updated by Grendel Prime (Dark Reign onward)). 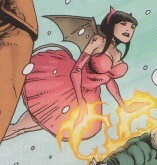 Presumably a demon agent of Satan (Kurios), she made a cloak for Satana when she was ten years old, growing up in Hell. Nothing else is known of her, though the cloak was later returned to Satana on Earth, by Leander Dyson. I don't know if her name has any real significance, but a Dame usually refers to the wife of a Knight (or a woman who has achieved Knighthood), and Aramanthe is a dragon from the "Tea with White Dragons" work of fiction, about which I know nothing. Seemingly the owner of a small curio shop across the street from the Camarilla's base, Leander found the weakened Satana--trapped in the form of Judith Camber--and brought her back to his shop. He acted surprised when she assaulted him, barely stopping herself from taking his soul, but he then explained to her who she really was, and why she had to stop the Camarilla immediately. When she returned to her true form, naked to the world, Leander gave her a cloak, which was apparently the same cloak the Dame Aramanthe had given her when she was a youth. He was a full-time field representative of the Orgeon Manufacturing Company covering the Southern California area, and part-time wife cheater for the same district. He was also pushing forty, partially bald, and overweight and underdeveloped, which made it harder for him to hustle a date than it used to be. He preferred San Diego, Santa Barbara, or even San Jose, where he could find bored wives and lonely widows, to LA, where he had yet to find a single girl who looked older than 18 years. He was about to give up on the club he was at when a fiery redhead with cat-like eyes tapped him on the shoulder, told him she'd been watching him, and asked him to go for a walk. He immediately followed her outside, and after a short walk, she recommended they stop in a nearby alley where she could get to know him better. The woman pulled him close, whispering, "Kiss me." Trembling with anticipation, Henry complied. Two second later he tried to scream! It all went very quickly. The skin on his face dried and collapsed in wrinkles and folds, the flesh on his bones seemed to wither and flake, and in ten seconds, "Hank" was reduced from a man to a desiccated corpse that really resembled nothing remotely human. The woman, Satana, rose up from what had been his face, and pulled the small, squirming butterfly that had been his soul from her teeth, and let it go, laughing as it fluttered away.